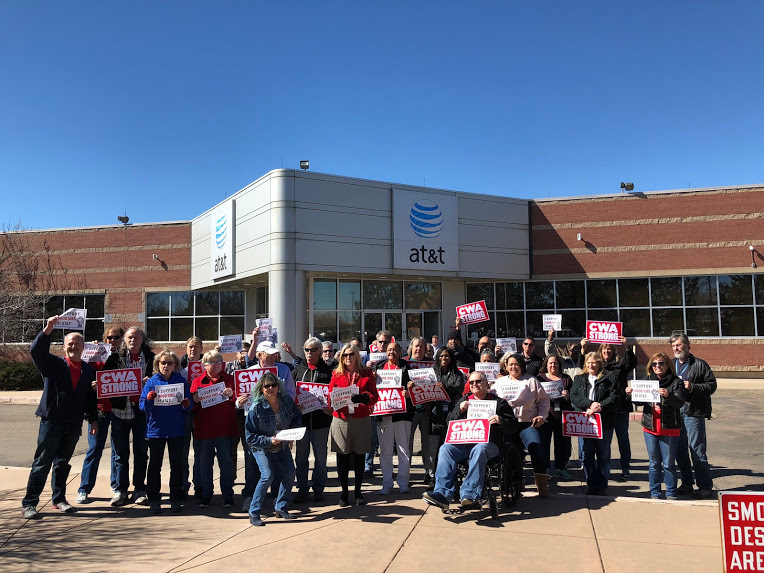 From opening day of bargaining through the "1 month To Expiration" countdown, CWA Members across the country have been busy mobilizing at AT&T Legacy T to protect and improve our rights,wages and working conditions. 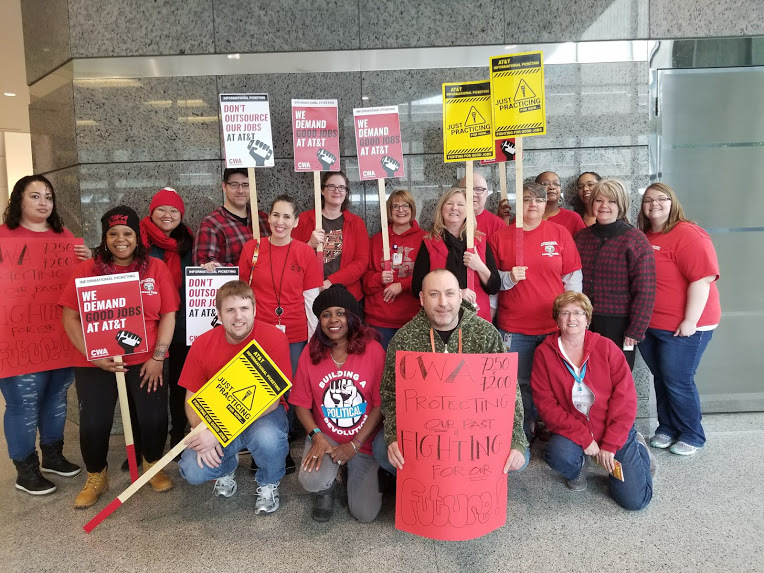 Our collective actions show the company we are united in our fight for a good contract. Here are just some of the great things that have been happening around the country. 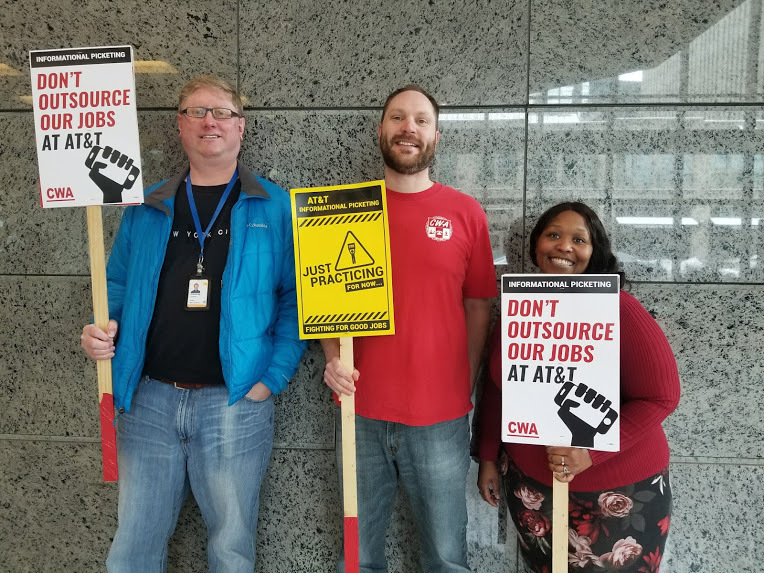 Local 1058 trained mobilization leads and participated in solidarity actions. 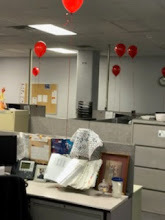 Local 1150 Distributed red and black balloons at every desk in multiple locations. Identified and trained over 10% of members on new mobilization program in NY & NJ. Participated in Opening day solidarity actions, including wearing red. 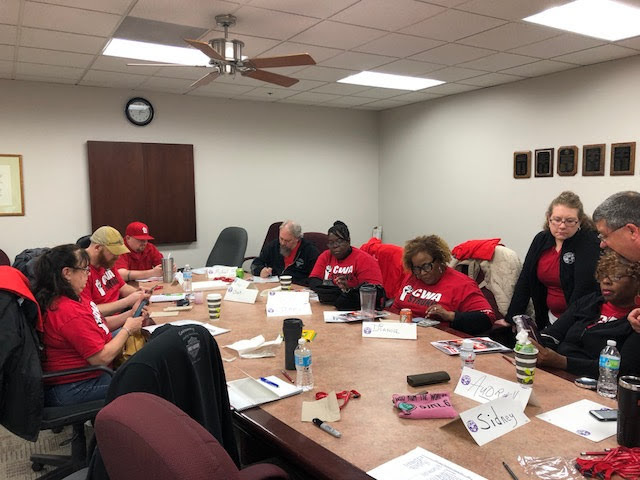 Local 1152 Proudly wore red, distributed flyers, stood at 11:52AM and made noise for 5 minutes and engaged members in mobilization training. Local 2100 members participated in an informational picket, held a tailgate meeting in the morning, and walked in to work united. Local 2106 Held an informational picket, and walked in to work together. Local 2252 showed support for the bargaining team by posting signs at work. 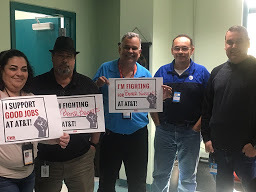 Local 3010 in Puerto Rico had members fill out and post signs showing management what they are fighting for. Local 3250 members wore red Thursday and black Friday. Mobilizers met to prepare and plan upcoming actions! Local 4250 is mobilizing around movement of work out of CWA. Local 4252 passed out cookies for kickoff and wore red show solidarity. Local 4621 members wore red. Local 4998 distributed flyers and members let the company know what they are fighting for. T-shirt on opening day. Members let the company know what they are fighting for posting signs at their desks. They distributed red balloon and I support my bargaining team signs. Local 6215 wore black and members filled out I’m fighting for signs. Thoughts for 6215 as they mourn the sudden loss of a coworker, union brother and friend. Peace & Strength. 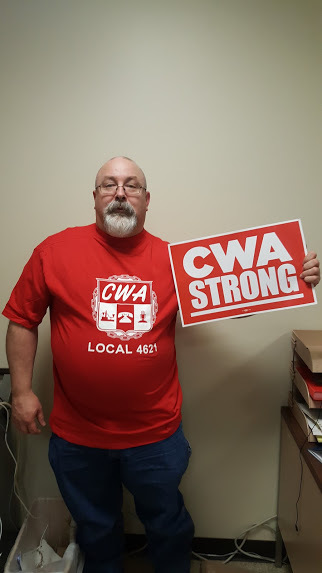 Local 6350 ordered CWA strong shirts for their members. 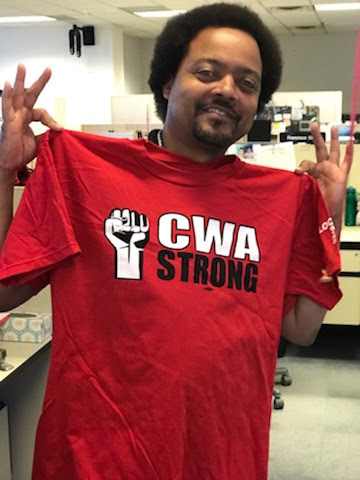 Workers added the CWA Strong avatar to Q Link. Kicked off bargaining day training mobilizers and participating in an informational picket with Local 6300. They held a Thursday rally with members wearing red. Desk dropped information marking the 30-day countdown to expiration, distributed Heart balloons and make sure members are aware of bargaining demands. The workers increased the quantity of flyers in the work area after managers expressing their disapproval. 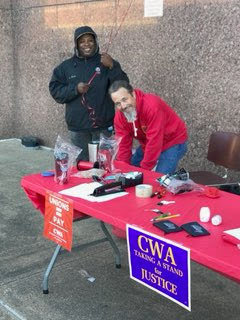 They held a unity BBQ and distributed CWA Strong signs to members. Local 6402 members put up posters in their Leg T areas and have engaged retirees in support of a good contract. 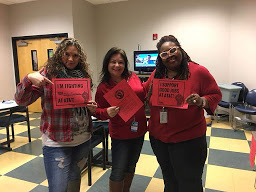 Local 6450 Held break room actions, filled out I support, and I’m fighting for signs opening day. Members wearing Red Thursdays. Local 7250 held opening day actions with Local 7200. 7250 Members wore red Thursday. Mobilizers distributed candy and reminders how to sign up for bargaining updates and reminded workers about the countdown. Local 7750 held an opening day flag pole rally with support of District 7 staff and VP, focused on education on how bargaining works for new LNS group, working on details for an upcoming rally with D7. Local 7906 planned actions for techs including informational picketing. Local 9415 inspired by their members in Hawaii will not “lei’ down. Local 13552 wore red shirts on opening day and passed out cookies reminding members of the one month to expiration countdown. Take time to reply on the eNPS survey to let the company know what is important to you at the bargaining table. You deserve a fair contract. Locals across the country are also gearing up to take the strike vote. It is important for people to take time to vote. We need everyone to understand that voting YES to strike is voting YES to protect jobs, healthcare, wages and working conditions. 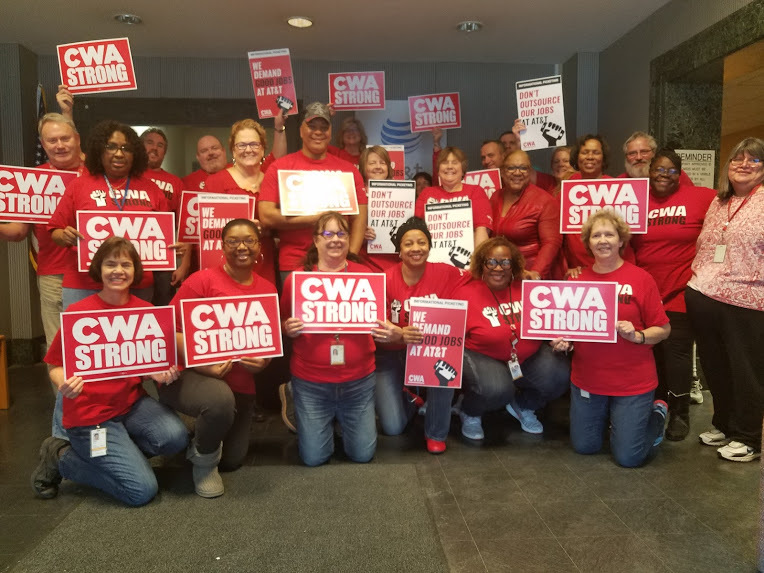 We want to thank all of the CWA Locals who took time to submit pictures supporting our fight and who sent positive messages of solidarity. We appreciate you. Check out bargaining reports and pictures on our Facebook page. Sent via ActionNetwork.org. To update your email address, change your name or address, or to stop receiving emails from CWA Telecommunications & Technology, please click here. In order to ensure that the most possible people are eligible to vote in the Local election, please be advised that the cut-off for membership is 1 week from day: March 22, 2018. The eligibility list will be updated by 5 pm on March 22, 2018 and then provided to the Election Committee. The April 30, 2019 deadline to apply for the Beirne Foundation Scholarship for the 2019-2020 academic year is fast approaching.